Constructed between 1868 and 1913, Mount Victoria Railway Station Group is of state significance as a large complex of buildings illustrating the pattern of development of railway facilities in the Blue Mountains area. It is the most substantial railway station complex in the Blue Mountains and indicates the former importance of the location. 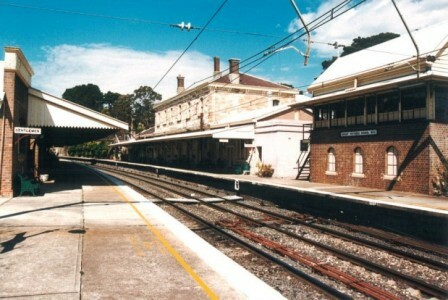 The Mount Victoria Railway Station is associated with John Whitton, Engineer-in-Chief of the NSW Railways, as the original station building was built to a design from his time, and with George Cowdery, Engineer-in-Chief for Existing Lines, as the two-level stone addition containing the Railway Refreshment Room was built under his supervision. A locomotive depot existed at Mount Victoria in 1897 and was greatly expanded in 1911-13 when duplication of the line through Mount Victoria was completed. The depot (now demolished) was home to the locomotives and crews who worked the famous ‘The Fish’ commuter train to Sydney and handling goods trains over the steep grades of the Blue Mountains, particularly the section to Lithgow. Mount Victoria also was the destination of the Caves Express from Sydney, which conveyed holidaymakers to the Blue Mountains. 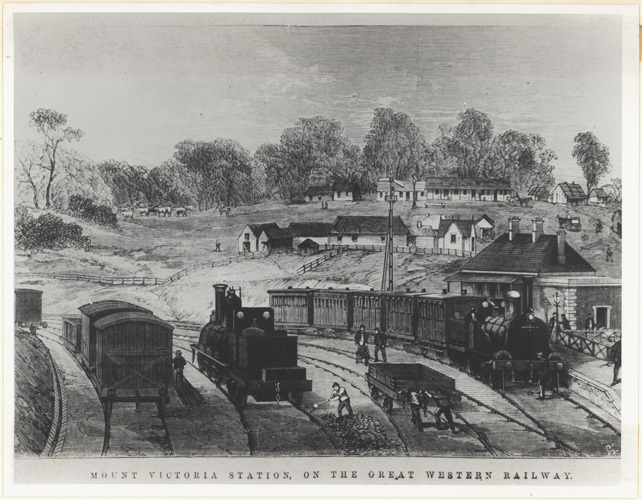 The station’s history is closely linked to Jenolan Caves. The station was the destination for the famous ‘Caves Express’ which operated between the 1920s and 1942 conveying holidaymakers to the Blue Mountains. It was also the nightly destination of the famous ‘The Fish’ train from Sydney. It was the only destination on the NSW railway system to have two named trains terminate one for commuters and the other for tourists. Mount Victoria has the first platform structure made of material other than timber built after Penrith station. The original station building still remains. Further additions were carried out in 1899 to the ladies’ toilet and other areas. The parcels office was added in 1911 to the Sydney end of the building. In 1884, the two level stone addition containing the Railway Refreshment Room was built under the supervision of George Cowdery, Engineer-in-Chief for Existing Lines and was built by George Dengate. The Refreshment Room contained on the upper level eight bedrooms for travellers and quarters for the Manager and family, again typical of NSW practice. Alterations to the Refreshment Room occurred in 1919 and additional bedrooms were built at the rear in 1943. The Refreshment Room closed in 1957 and now houses the Mount Victoria and District Historical Society Museum. The pedestrian footbridge linking both platforms was of truss form and built in 1911, replacing an earlier c.1896 bridge. It is largely in original condition and is typical of the design used throughout the NSW railway system. The footbridge is rare as an intact example of a standard Warren Truss trestle and stairway with channel iron stair stringers. The Mount Victoria Railway barracks is an unusual surviving example of a purpose built rest-house still used by the railways for staff accommodation. The construction of accommodation for enginemen, train guards and other on-board staff was provided by the NSW Government Railways from the 1880s. In the late 1890s, a standard design of barracks was approved. Those at Mount Victoria reflected a standard arrangement with rows of four bedrooms on each side of the building. There was also a central kitchen and meal room, reflected in the roofscape by a large transverse gable. A toilet and Attendant’s Room completed the plan. It continues also to be used for non-overnight purposes, for meals and locker accommodation. On the Lithgow-bound platform is an elevated signal box. It was constructed in 1911 and continues in service. It is built to the typical elevated signal box design dominant between 1910 and 1920. Externally it is a large two-storey face-brick and timber signal box with a corrugated iron gabled roof featuring simple bargeboards, turned timber finial and boxed eaves. The gable end is clad with rusticated weatherboards and has a timber vent. It has 6-pane horizontal sliding band windows on the upper floor some with internal steel security mesh. There are 9-pane arched windows on the ground floor with rendered sills. Access is via steel stairs to a landing on the south elevation. Internally, the signal box retains many of its original/early equipment within a refurbished and interiors including plasterboard panelled ceilings, modern light fittings, vinyl floor coverings, modern kitchen facility and cupboards. Early timber panelled walls in the store room still exist. The 48 lever interlocking machine is still in operation. The signal box is one of a few examples of brick on platform elevated signal boxes that remain in operation in the state. Please follow the instructions of Station Staff and stay within public areas.